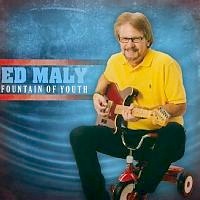 Ed Maly "Fountain of Youth"
This is the third CD that we've received for review from Houston-based blues rocker Ed Maly. On this CD he manages to put 20 tunes clocking very close to the full 74 minutes! Ed and a long guest list of friends manage to play some great grooves, and the chemistry and musicianship is outstanding. While the music really works, I can't say I am a huge fan of the lyrical content or the vocals. For the most part they work, but once in a while something doesn't seem to mesh. Some of the lyrical choices occasionally draws a chuckle and at other times it is just downright cheesy, as on “Houston Texan Time”. The CD also contains several covers, most notably “Moon Dance” by Van Morrison and “Red House” by Hendrix. The reason bands do covers is usually do add their take and enhance the songs. I can't say that the covers presented here enhance the originals. While decently performed as far as the bed of tracks is concerned, Ed seems to be having a really hard time on vocals, and he straight out butchers "Moon Dance". There are songs that work well with Ed's vocal style, like the ballad “Once You've Been Down”and “Gravestone of Mine”, so probably if the songs have been a bit more cherry-picked for a shorter and more concise release all would've been fine. That is usually the reason why people pay producers, and this album could have definitely used a higher veto on some things. The production on the CD seems to vary a bit from song to song. The instrument balances change as does the vocal level, probably due to the fact that it was recorded at several different sessions and probably in different locations. Towards the end it feels like the material presented is not as of a high standard as earlier songs. Overall the tunes are enjoyable, the guitar performances are good and occasionally great, but the vocals and lyrical content seems to take this down a notch in quality as far as I am concerned.